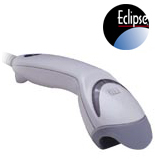 Eclipse is a single-line, hand-held laser bar code scanner. Equipped with CodeGate technology, Eclipse can easily target the desired bar code and complete the data transmission with a simple press of a button. or call (541) 601-8282 for more info on the Eclipse Bar Code Scanner.